Tucked away on Bevier Hall’s second floor, Bevier Café is part east campus eatery, part learning laboratory, and part sustainability trailblazer at the University of Illinois at Urbana-Champaign. Each semester, undergraduates in the Food Science and Human Nutrition (FSHN) department’s Quantity Food Preparation and Service course spend time in the café managing the establishment’s day-to-day operations, mastering the ins and outs of food service, and learning how to be sustainable in the workplace. 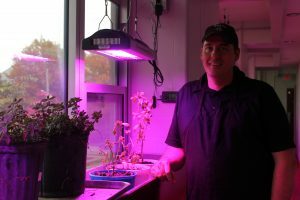 The café functions as a hub for three Student Sustainability Committee (SSC)-funded projects: the Bevier Café Reusable Carry-out Program, Turner Hall’s Aquaponics System Demonstration Unit, and the Bevier Café Herb Garden. At the helm of these campaigns is Carter Phillips, the café’s Quantity Foods Manager and Instructional Chef. A U of I alumnus and seven-year employee, Phillips is a testament to the program. “I’ve worked in full-service restaurants, high-end catering, and most recently with dining services and premium seating in Memorial Stadium. I had an opportunity to come back and help teach the class that I took … and it’s been exciting to help spearhead some of these projects,” Phillips said. Since its student-led inception, this “Choose to Reuse” program has evolved into a 150-customer operation. Patrons pay a small enrollment fee for the opportunity to employ reusable containers (rather than disposable takeout boxes) for on-the-go dining. 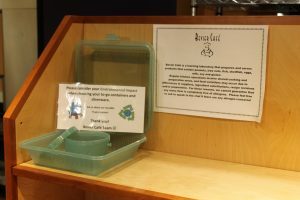 To date, the program’s patrons have redeemed and used Bevier’s containers just shy of 3,000 times, preventing as many containers from ending up in landfills and even cuttings costs at the café. Bevier Café’s second foray into sustainability is also student-driven, and it has roots in the Grand Challenge Learning program, an Illinois-led initiative offering classes that promote interdisciplinary education, citizenship, experiential learning, and research. 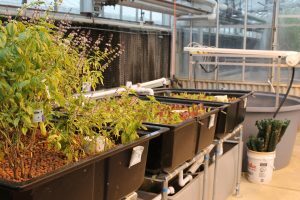 The Turner Hall greenhouses — a short walk from Bevier — host the U of I’s pilot venture into aquaponics, a merging of aquaculture (fish farming) and hydroponics (the process of using nutrient-rich liquid to grow produce). “The fish excrete waste into the water; the water is pumped into grow beds (raised planters on top of the tanks); the grow beds fill up and drain, which keeps the roots constantly wet; the roots clean the water for the fish; and the fish in turn provide nutrients for the plants,” Phillips said to describe the system’s symbiosis. Bevier Hall predominantly harvests the produce side, which boasts a relatively short one-month growing cycle compared to the protein side’s six- to 12-month turnaround. However, the two occasionally overlap to be harvested together. “Last fall, we served tilapia in combination with tatsoi, a Chinese green. They were harvested less than 200 yards from Bevier Hall, and we were able to serve them on the same plate,” Phillips said. Bevier Café’s newest sustainability initiative is its in-house herb garden. The garden is Phillips’ passion project, and he is excited to see it come to fruition. “I’ve been wanting to do an indoor herb garden since I started. When we installed this hallway as a fire egress, it gave me a perfect opportunity to get the herbs going,” Phillips said. The would-be fire exit hallway has blossomed into an excellent environment for hyper-local produce. It houses enough basil, mint, thyme, sage, rosemary, and oregano to comprise almost 90 percent of Bevier’s total herb usage. This percentage is only set to increase as microgreens like beet, pea, and sunflower shoots are incorporated. The corridor’s indoor conditions are ideal for growing a wide variety of herbs — purchased produce is often difficult to keep fresh and tends to spoil quickly in storage. One advantage to on-site gardening is the opportunity to orchestrate optimal growing conditions. Currently, Phillips is experimenting with various types of lighting: eight LED PRO Lights in shades of blue and red currently line the ceiling, casting the hall in a pink-and-purple glow. Carter Phillips and herb garden. Photo by Jenna Kurtzweil. The herb garden’s benefits extend well beyond the kitchen. While undeniably convenient, cultivating herbs in close proximity also cuts back on the energy and fuel needed to import produce from places like Florida, Mexico, and South America. While Bevier Café might not have the square footage to impact national carbon dioxide production, its commitment to education fosters a global scope of impact. Like its website says, Bevier Café is “more than just a great place to eat” — it’s an instrumental step in fostering an up-and-coming generation of sustainability-conscious food-service professionals.